In this section I will guide the reader through the interpretation of the different strain/ SR graphs. All relevant definitions are found at the beginning of this document. For the sake of simplicity I present only a single graph in the figures instead of the 6 different regional and additional global graph projected in simultaneously, since this often looks chaotic/intimidating in the beginning. I will start with the displacement and velocity graphs, subsequently followed by the strain, strain rate, and the rotation/torsion graphs. 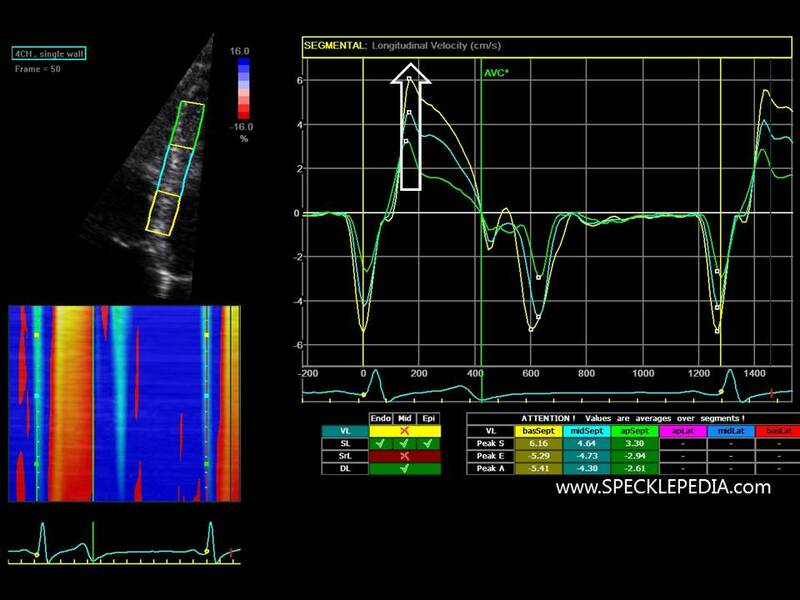 Key to the correct interpretation of cardiac mechanical events is a high quality ECG recording and preferably timing events of the cardiac valves (i.e. aortic valve opening and closure, and mitral valve opening and closure). These can be obtained by the pulsed wave interrogation of the respective valves, by the 2D images, or by M-mode registrations of valve motion. The amount of displacement is plotted on the Y-axis and typically expressed in mm or cm. The X-axis plots the time and shows the corresponding ECG. The amount of displacements is relative to the point of onset, typically set at the beginning of the QRS complex, and calculated in the direction of the longitudinal axis in the apical views and in the direction of the center of the left ventricle in the short axis views. In systole, the mitral annulus moves towards the apex due to the longitudinal shortening. This is reflected by the positive displacement. This reaches is maximum at the time of the aortic valve closure (or at the end of the isovolumetric relaxation). After this, the displacement decreases towards the baseline. This decrease is typically a three step process induced by a decrease in displacement during the early diastolic filling period, the diastasis (where there is minimal to no displacement) and finally the last decrease towards the baseline due to the late diastolic filling after the P-wave on the ECG. In the normal functioning heart there is a gradient of velocity from base to apex due to the myocardial deformation (longitudinal shortening). This gradient can be appreciated in both systolic and diastolic period. See the figure below. The white arrow highlights the gradient in peak systolic velocity. In case there is no longitudinal deformation, e.g. in case of a transmural myocardial infarction, there is consequentely no velocity gradient. 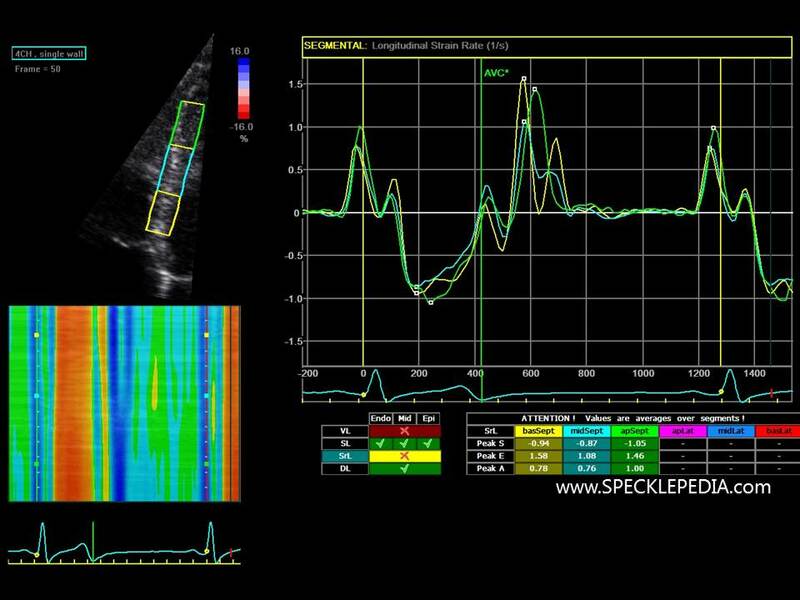 The calculation of the velocity gradient within a predefined region of interest had been used in the Doppler derived deformation calculation. Currently, this technique has been abandoned / replaced by speckle tracking deformation analysis. 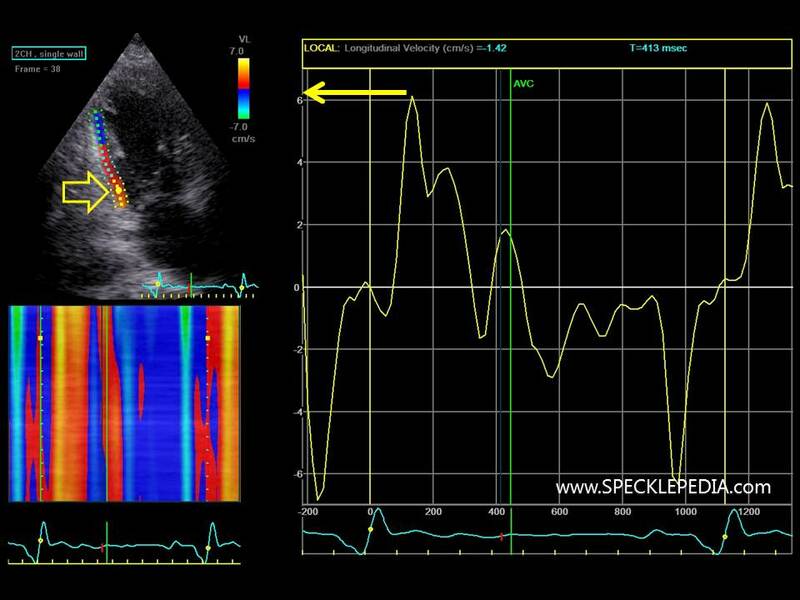 Note in the example below that the peak systolic velocity in the basal segemnt is 6cm/sec. This is identical to the figure above. 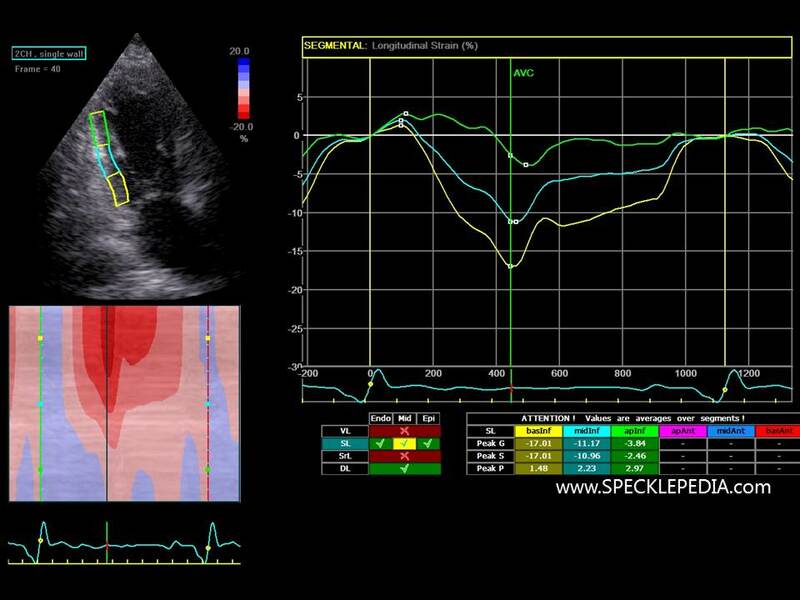 However, this case comes form a patient with a transmural inferior wall myocardial infarction. The longitudinal velocity is due to thetering of adjacent segements. Indeed, note that the velocity gradient is absent in this case (indicated in the white box). All segments of the inferior wall move in synchrony due to the lack of logitudinal shortening. The subsequent defromation graphs will follow below. The deformation graph presents the amount of deformation (shortening, lengthening, thickening) within a specified region of interest during one cardiac cycle. Since deformation is a relative value (amount of change in length expressed in a percentage), it is important to identify the starting point of the deformation. This is typically set at the onset of the QRS complex. This implies that all change in geometry is expressed in a percentage relative to the initial length/thickness. Therefore the strain value at the onset point is 0%. The strain value at the end of the cardiac cycle (i.e. the onset of the next QRS complex) is also 0%. Form a physiological point of view, the size of the region of interest is approximately identical at the start of the next cardiac cycle. Since the tracking throughout the entire cardiac cycle is often not perfect, drift compensation is applied (see 2the section of artefacts). This feature arbitrary puts the strain graphs at the zero-point at the next cardiac cycle. Deactivating this compensation provides some insight into the tracking quality; in case the deformation graph deviates to much from the zero-line, you might want to consider optimizing the tracking or omitting the segment from the analysis. Interpreting the strain graph starts with identifying the different mechanical events throughout the cardiac cycle. Again, these are divided as explained in the velocity section. A high quality ECG recording is also of importance. The different specific deformation events are explained in the “definitions” section. The presence of all expected events is important to identify, since this is also a check for the quality of tracking. My most important advice would be to assure yourself with the quality of the tracking before interpreting the findings. This take practice and experience. Is the tracking visually acceptable / good? Are all the different mechanical events identified in the graph? Is there not too much drift compensation applied? Not too much noise on the graph? Are the results in line with your expectations? The last question might be surprising, but should always be considered. 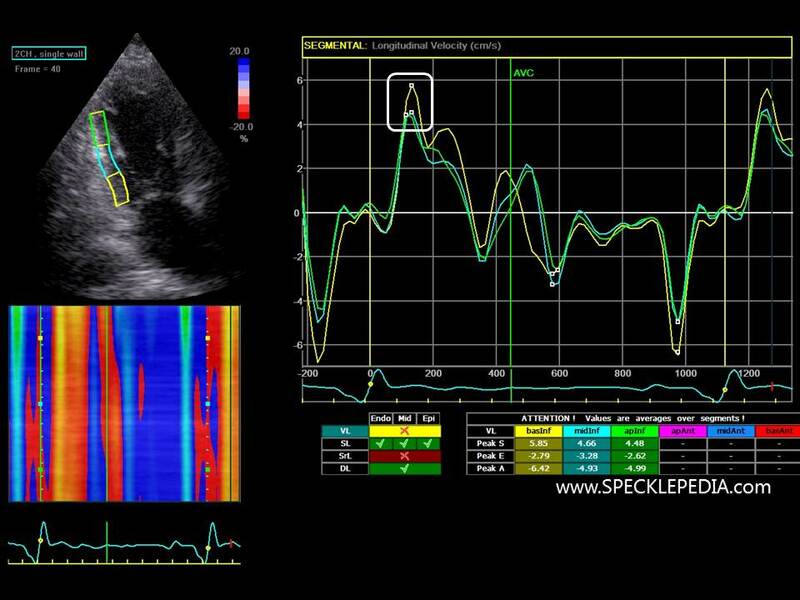 The deformation analysis is but a part of the echocardiographic examination. Normal deformation values in a region where a transmural myocardial infarction/scar can be seen on the B-mode images, or very abnormal strain properties in a healthy individual with completely normal findings on the ultrasound should alert you to an artefact rather than an actual representation of myocardial function. The aspect of a normal strain graph is presented in the clinical examples (“normal”). Different myocardial disease states give rise to specific alteration in the strain graph. Some examples are: the onset of shortening is increased, there is systolic stretching, the peak systolic strain value is impaired, there is post-systolic shortening, the mechanical dispersion is increased. These specific mechanical “fingerprints” in deformation are explained and illustrated in the different sections in the “clinical examples” section of the website. 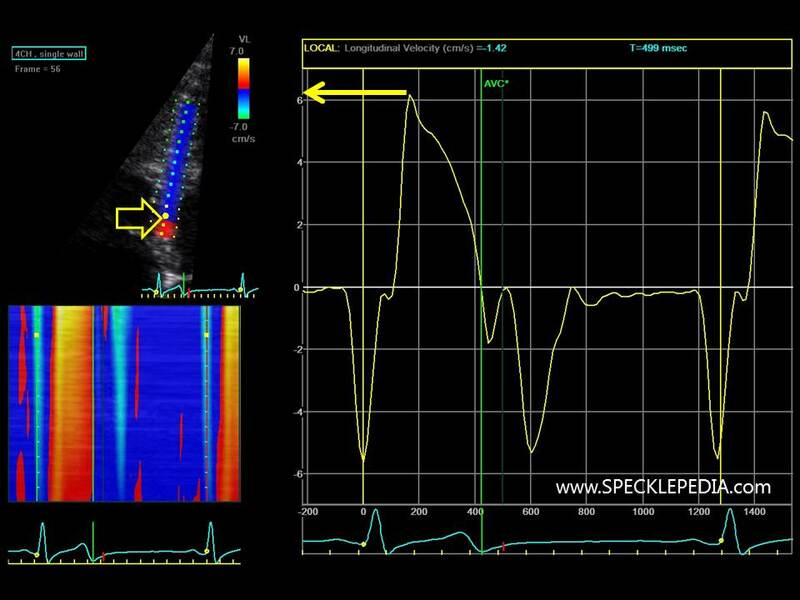 Strain rate is the speed at which the deformation is occurring. In other words, it is the temporal derivative of deformation. Thus, the faster deformation is occurring, the higher the amplitude of SR and when there is no change in deformation, the SR is zero, despite the amplitude (or value) of the strain.